I started by spraying some mist on my paper, then placing some paper strips horizontally across the page. I used the same photo placement, a similar paper cluster in the top corner and a tag on the opposite side. I added moustache embellishments and a title I found on the internet. I am not sure that I did the original LO justice, but I am really pleased with my finished creation recording DD and her friends with their moustaches! Love your moustache page....and the sketch. 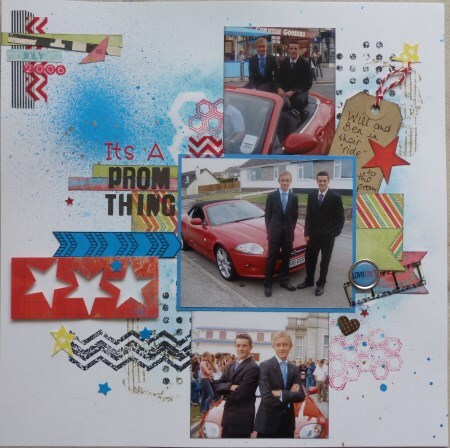 Love the way the prom layout captures the spirit of youth.